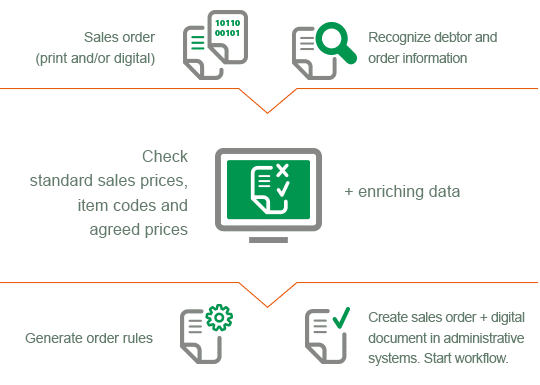 Trading companies that receive repeat orders from existing clients, are frequently sent purchase orders that need to be processed manually and converted into a sales order. The processing of orders, checking on agreed prices and archiving the original documents is an error-prone and time-consuming process that requires a great deal of attention from your administrative staff. The incoming orders are stored, so that it is possible to look them up in case of queries about the sales invoice. Retrieving the right documents can take up valuable time. By processing your sales orders automatically using ImageCapture you can save valuable time, and avoid the errors that tend to occur when data is entered manually. ImageCapture is a scan and recognition software that can be implemented flexibly to process both the paper and digital purchase orders you receive, and automatically convert them into sales orders for your financial systems. The software integrates fully with your ERP system, and directly accesses and uses the debtor information that is held in your financial systems without having to regularly synchronise master data. On our links page you will find an overview of all our available integrations. Do you not see your application here? Scan Sys is continuously developing new standard links to ERP and financial applications. Please contact us for more information.